Welcome to the McDonald's of Jackson Web Site! This site is here to keep you up to date on our newest promotions, our current menu items, our community events, and the locations of our stores. Click on the Arches below to learn more about these topics, and to have some fun. Click Here To learn about our New Look, and our Grand Re-opening on October 25, 2001! 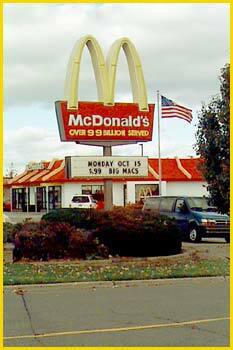 To learn more about McDonald's Click Here to go to our Corporate Web Site!